When ever we can get outside of the house or classroom, we try to make the most of it. A bright sunny day is just calling for some outside play and learning for all ages. I started with an Invitation to Play with the materials pictured above. An 8 month old and 3 year old dive right in. Both practicing different skills and learning from the same yet different experiences. Above there are fine & gross motor skills being practiced, sharing, painting, sensory experience with water, writing, stamping, concentrating, observing. Learning about gravity and properties of water. The water runs towards the lowest point. Painting water over the top of chalk gives it a strong and vibrant colour. Use descriptive language. Look... no strings! Baby learns by chasing around a stick of chalk. The curved surface makes it roll. Just making footprints? No. Learning about patterns, shapes, printing, mirror image and evaporation! Learn more about numbers. Writing them, tracing them, counting and stamping the corresponding number. 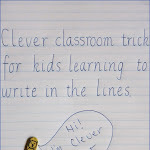 - Simplify this activity for younger children by providing as an "Invitation to Play" and seeing where they go with it. There's no need to push a specific literacy/numeracy focus. You can see the learning they can get out of simply exploring the materials. - Extend this activity for older/more advanced children by encouraging them to write spelling words, play giant games of tic-tac-toe, work on group problem solving, represent harder maths equations on the concrete, test evaporation in different weather conditions, write brain maps etc. - Always supervise young children when outside, around water or possible choking hazards. - Mix it up by adding different materials to investigate and explore outside in the same way. Try the same materials plus a pile of twigs, or without chalk and only water, add pebbles/stones/leaves...etc. 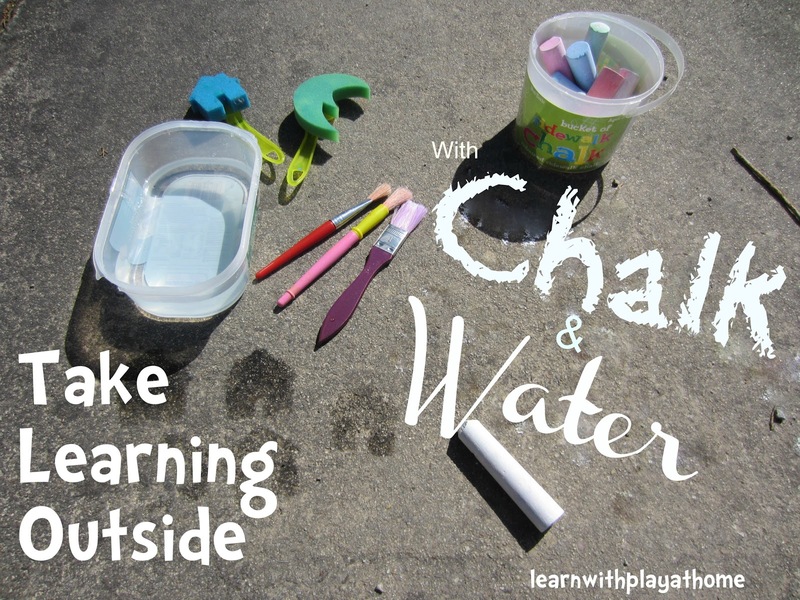 - Use chalk outside to learn more about the parts of the body. 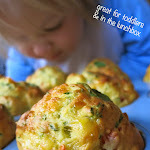 I look forward to trying this with my little girl and my baby (when he or she is old enough!). It's a great activity for older and younger children to do together. Have to file this away for sunny weather. Great ideas as always!! 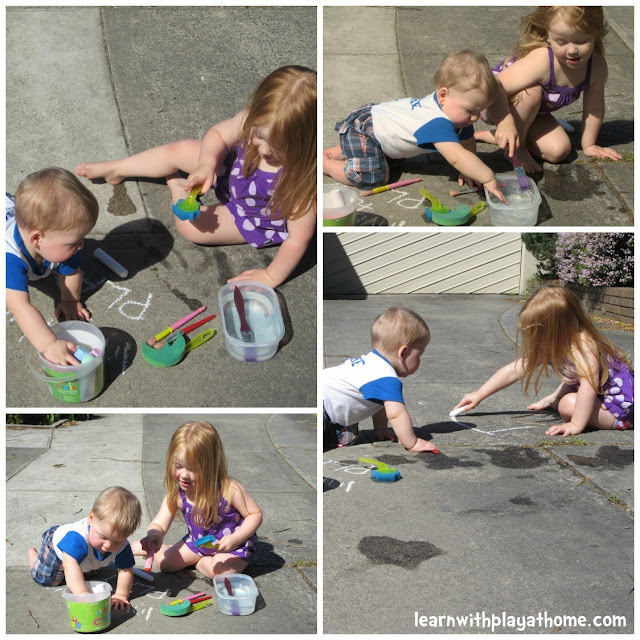 Kids love to be outside, using water and making marks with chalk. Roll them all into one day and you have a brilliant activity that keeps them interested and entertained. Love it. Thanks for posting. 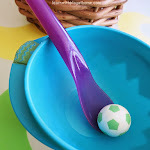 I love how the same materials can be enjoyed by both a toddler and a preschooler. These are the best kinds of materials, so open-ended. Look at your little man having a ball! I love chalk and water painting...always keeps young and older kids so busy and they are so colourful! I absolutely love how chalk and water can be played with by all kids of all ages. 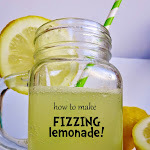 Next time I will have to add some wet sponges to create shapes too....such a fab idea Debs!